Managing social media accounts for a couple of brands gives me the opportunity to be aware of some fun holidays and events on the social calendar. One of those is National Camera Day, which just happens to be today. So, of course, I had to make some camera cards to celebrate the occasion. Scroll down to learn how I made these cuties with my We R Memory Keepers Punch Boards. To create these easy camera cards I used the 123 Punch Board from We R Memory Keepers, but these instructions will also work with the Envelope Punch Board. First I created my A2 (5 1/2 x 4 1/4) card by cutting my Bazzill 12x12 cardstock to 11 inches wide and 4 1/4 inches high. Then I scored the card at 5 1/2 inches and folded it in half to create a landscape card that opens at the right. Then I placed the folded card into the punch board, lined it up with the 1 1/2 inch line on the guide, and punched. 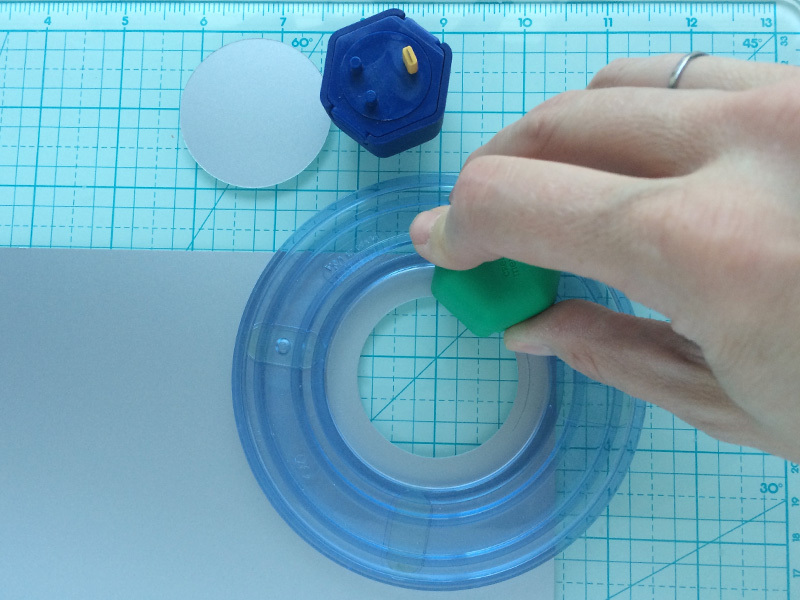 You'll want to put your punch board on a solid surface and use your body weight since you'll be punching through two sheet of cardstock. Flip the card over and repeat the above step on the other end of the card so that it looks like the left image below. Then trim the two top end sections off as seen below so your card ends up like the image on the right. Next, round each of the four corners of the card using the reverse punch at the top of the punch board. Remember, the 123 Punch Board has a slit punch and a corner rounder at the top, so be sure to use the correct reverse punch. Once you have your camera shape, you can decorate your card however you'd like. My design was inspired by the Polaroid One Step Land Camera. I used some We R Memory Keepers Washi Tape to create the rainbow stripe, layering it over some white cardstock before adhering it to the camera. I used my circle cutter to cut a 2 1/2 inch black circle for the lens. Then I cut a 2 inch circle into some matte silver cardstock, and centered my 2 1/4 inch circle cutter over that to create the silver ring for the lens. I used a cool crafting hack to create the black label: I saved the grey cardstock leftover from my We R Memory Keepers Euro Punch and then trimmed off the top bump as seen below. I finished off the card with some Enamel Dots and a 3/4 inch silver square for the flash. This is a fun card that can be used for any occasion from birthday, to travel, to friendship, to plain old "hello". Just add a personalized note on some white copy paper inside, place it in an A2 envelope, and you're good to go! hi may i ask what circle cutter is that? which company is it from? Hello! That's my old Creative Memories circle cutter.